NISA Twitch Stream Revamp Incoming! | NIS America, Inc.
Home / Blog / NISA Twitch Stream Revamp Incoming! Ready for some Prinny Awesome Streamin', dood!? Hey-ho! We’ve got some exciting news to announce regarding NIS America’s future Twitch streams! What does this mean? Read on, dood! As we all know, our current Twitch streams were weekly on Tuesdays at 5:30PM Pacific Time. Beginning with our next stream on May 26, 5:30PM Pacific Time, we will be turning our Twitch schedule to biweekly Thursday streams. This gives everyone something to look forward to as we fill our streams to the brim with NEW content, challenges, quizzes and shenanigans! Good streams take time to plan, so we hope that this new schedule gives everyone even MORE reason to tune in! We'll be having NEW content, challenges, quizzes and shenanigans in our future streams. We've started incorporating them in our past couple of streams already, so be sure to check out our Stranger of Sword City and Grand Kingdom Beta streams and see what I mean! In addition, we will be implementing viewership and follower milestone achievements that will rely on all of you to make them happen! From free giveaways to raffles, the possibilities are endless! 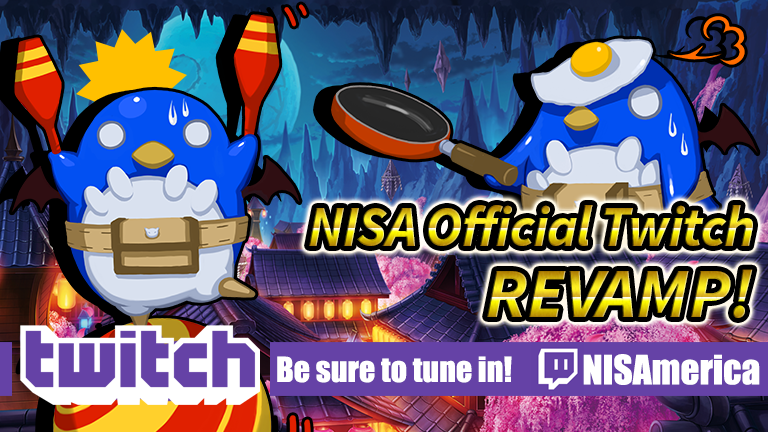 So go ahead and follow us on our Official NISA Twitch channel for more information coming Prinny darn soon! Check out our Twitch schedule and be sure to RSVP to each of the Twitch streams you will be tuning into! We hope you’re just as excited as we are, if not more! See you all next stream, dood!